Major stocks around the globe have been rising since the turn of the year, and share prices in the UK are no different. 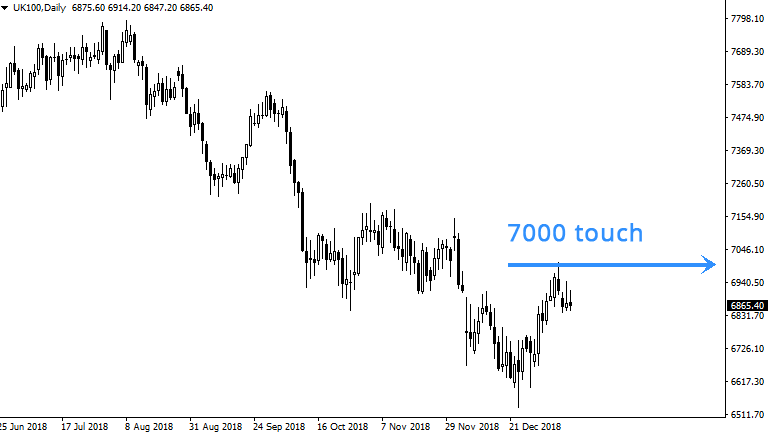 The FTSE 100 index was roughly 450 points off the December lows at the tail end of last week, when the index price briefly hit 7000 in early trading and fell sharply for the rest of the day. Investors had renewed appetite for buying stocks as 2019 rolled in, and share prices of most companies have responded. However, they now seem to have stalled as once again Brexit uncertainty looms. Theresa May’s Government were soundly defeated by an overwhelming majority on the vote for her proposed Brexit deal with the EU. Once again this throws out uncertainty on UK businesses and economy. Uncertainty is a real drag on any market, and Brexit continues to be one of the most uncertain issues the UK has faced in modern times. Whilst GBP responded to the result with a huge gain, FTSE 100 futures began to retrace. Surprisingly there has been no real crash in share prices, but they do look to be stalling as if they await further developments on how the Prime Minister will approach the defeat with an alternative idea. European and US stock indexes seem to be holding firm also, which is probably helping the FTSE stay stable. The DAX30 index is currently around 600 points up from its December low. Micro cap stocks on AIM have also been seeing some spectacular gains. Shares such as EQT, which is up over 100% since December, and INFA, which has also gained around 90% since December. Many other AIM stocks have made good ground, after what can only be described as an awful 2018 for micro caps.